Here you can find a strain description about StarBud and also some user-based reviews and infos directly from the SeedFinder (if available). You can also find the offers and auctions here if StarBud cannabis seeds are on stock at MyCannapot right now. StarBud is our Indica flagship. A beautiful and potent Indica strain originating from the mid west USA with buds so frosty they sparkle like stars in a clear summer night. StarBud finishes around 60 days and produces super compact buds with a medium yield of the highest quality medical as well as recreational cannabis. 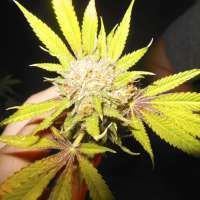 A 1st place in the 2009 ICMag 420 Cup in the category "Breeder Indica" was already won with this strain. Initiation of flowering onto around 25 cm. - Final Height onto around 85 cm. SilentL Ordinary difficult ( grow ) , normal harvest , insane strong :) . Nice Taste :) , smell little like cigarr in the room + ordinary smell. smokealot Absoluter Schrott für viel Geld.Hatte 5 fem. Seeds wovon nur 1 Pflanze überlebt hat. Diese hat allerdings gut performt.Das High ist auf jeden Fall Wahnsinn, allerdings nicht öffentlichkeitstauglich ;-) Würde sie niemandem weiterempfehlen,es gibt besseres auf dem Markt der Couch-Lock Indicas. StarBud is not available at our shop at the moment!